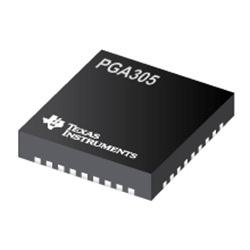 The Texas Instruments PGA305 device provides an interface for piezoresistive and strain-gauge pressure-sense elements. The device is a full SoC solution that combines programmable AFE ADC, and digital signal processing that allows direct connection to the sense element. The device also incorporates integrated voltage regulators and an oscillator to minimise the number of external components. The device can use third-order temperature and nonlinearity compensation to achieve high accuracy. The device can also use the integrated I2C interface or the OWI to perform external communication and simplify the system calibration process. An integrated DAC supports absolute-voltage, ratiometric-voltage, and 4mA to 20mA current-loop outputs.